For other configuration items refer to Config/AppServers/*.xml files. created and then tuning was done using tun2.sh. One application server instance used for this benchmark. X4200 comes with 4GB(4X1GBDIMM) which was taken out and 16GB(8X2GB DIMM's) were put in. the two Sun StorEdge 3320 arrays. This extrapolates to 6.1 GB of storage for a 24 hour run. 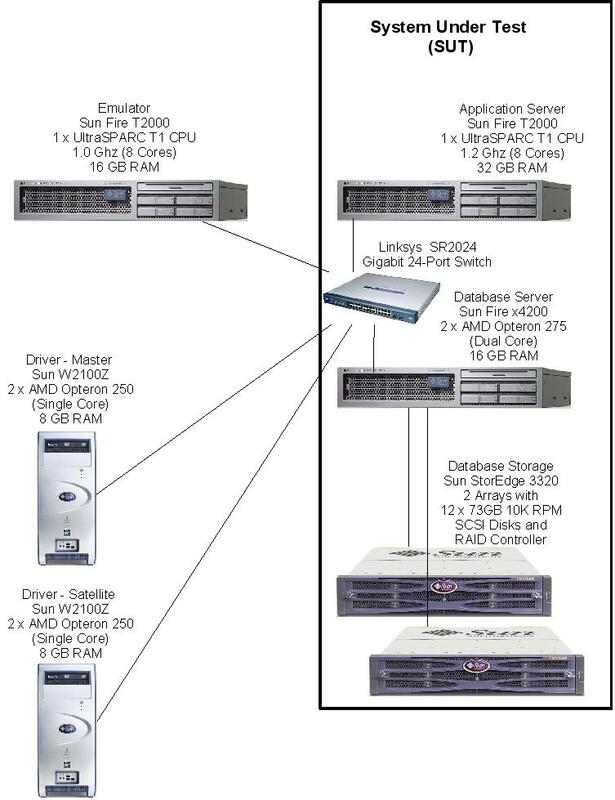 Each Sun StorEdge 3320 SCSI Array was configured as a single RAID 1 logical drive. WebSphere Application Server V6.1 uses pass-by-value as required by the EJB Specification. Java(TM) 2 Runtime Environment, Standard Edition (IBM build 1.5.0_06-erdist-20060404 20060511).